How Do You Know I’m Real? More than that how do you know if anything is real? I was sitting in the living-room yesterday and watching Cleo dream. She was on the floor in front of the lit fire and happily involved in her dream. Young Cleo, May 12th, 2012. She was such a beautiful dog. It was natural of me to wonder of what she was dreaming. I could see her feet twitching and her eyelids flicking as though she was dreaming of chasing. But any more than that was pure speculation. 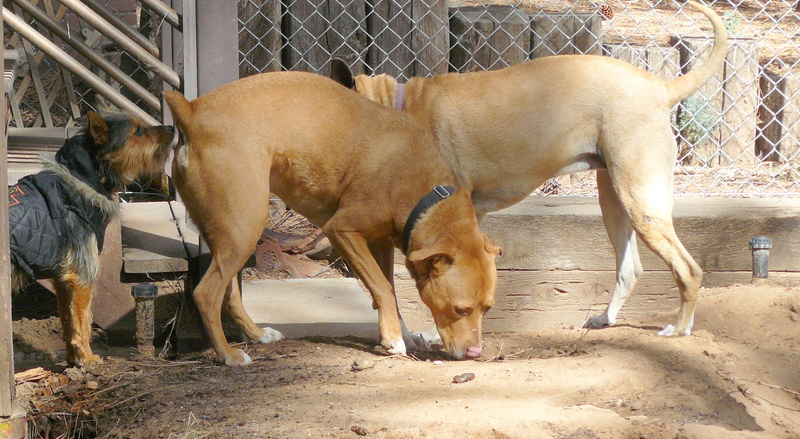 Then I mused about how the world looked for Cleo, and for the rest of our dogs come to that. Then I went back to a philosophical article that I read quite recently. What does it all mean? Are we real? What is reality? Two more examples of deep thinking. Note: We have a flooring contractor in the house all week and it’s making it a little tricky to spend the couple of hours a day that is my usual pattern for writing posts for LfD. So apologies if this week’s posts are more dependent on the thoughts of others than is usual. 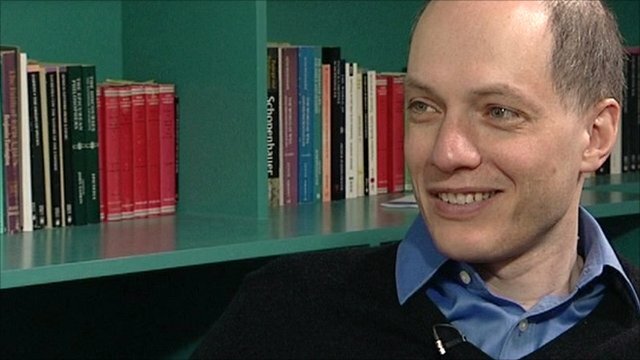 Alain de Botton, FRSL (born 20 December 1969) is a Swiss/British writer, philosopher, television presenter and entrepreneur, resident in the United Kingdom. His books and television programmes discuss various contemporary subjects and themes, emphasizing philosophy’s relevance to everyday life. He has been the presenter of a BBC Six-part series called Philosophy: A Guide To Happiness. And who wouldn’t be turned on by that! Luckily, all six episodes are available on YouTube, at this overall link. But I wanted to share the first episode because despite the title being Socrates on Self-Confidence it really speaks to our lives in this year of 2013. A recent item on Big Think, again about philosophy, jumped off the page at me. It specifically looked at making our life, as in mental health, easier in these demanding times. It was by Daniel Dennett and was called The Philosopher’s Self-Help Book. While Silicon Valley and Silicon Alley busy themselves making every aspect of our lives more efficient (except, perhaps, for the process of discovering these new technologies, learning them, and integrating them into our lives), Daniel Dennett sits up at Tufts University in Massachusetts, philosophizing. His latest book, Intuition Pumps and Other Tools for Thinking is an attempt to make transparent some of the tricks of the philosopher’s trade. In an accelerating age, it’s a self-help book designed to slow the reader down and improve our ability to think things through. The kinds of things Mr. Dennett likes to think about include the nature of consciousness, evolution, and religious belief. But the mind-training his new book offers is applicable to any problem you want to consider thoroughly. In an age of quick fixes and corner-cutting, we’re in constant danger of bad decision making – of overreliance on what cognitive psychologist Daniel Kahneman calls “system 1”, and what most of us call intuition. This rapid decision making channel of the brain is helpful when we are in mortal danger, or pressed for a quick decision within our areas of expertise. But for most decisions, the slower, more deliberate channel (system 2) is much more reliable. What Dennett offers, then, in Intuition Pumps, is a workout for system 2 – a series of thought experiments you can apply to puzzles real and imagined to bulk up the slower, wiser parts of your consciousness. Suppose lightning strikes a dead tree in a swamp; I am standing nearby. My body is reduced to its elements, while entirely by coincidence (and out of different molecules) the tree is turned into my physical replica. My replica, The Swampman, moves exactly as I did; according to its nature it departs the swamp, encounters and seems to recognize my friends, and appears to return their greetings in English. Walking us through Davidson’s considerations about whether and to what extent the Swampman is anything like Davidson, and related ones about a cow that gives birth to something that looks exactly like a shark (yet has cow DNA in all of its cells), Dennett teaches us a surprising lesson about the utility of wild philosophical speculation. Cloaked in the breezy, familiar trappings of a self-help book, Intuition Pumps is in actuality a dark mirror of that genre – a field of rabbit holes designed to leave the reader with more questions than answers, and wiser for the long and indirect journey. 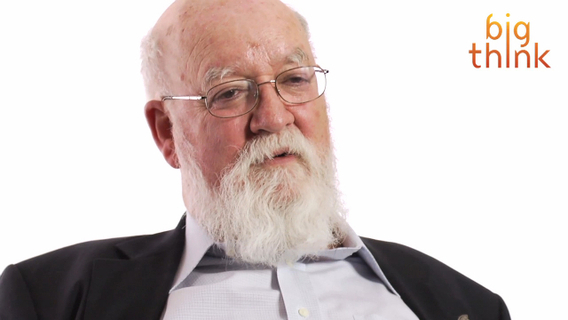 Watch for Daniel Dennett’s Tools For Better Thinking – a Big Think Mentor workshop coming soon. One of the world’s leading philosophers offers aspiring thinkers his personal trove of mind-stretching thought experiments. Over a storied career, Daniel C. Dennett has engaged questions about science and the workings of the mind. His answers have combined rigorous argument with strong empirical grounding. And a lot of fun. Intuition Pumps and Other Tools for Thinking offers seventy-seven of Dennett’s most successful “imagination-extenders and focus-holders” meant to guide you through some of life’s most treacherous subject matter: evolution, meaning, mind, and free will. With patience and wit, Dennett deftly deploys his thinking tools to gain traction on these thorny issues while offering readers insight into how and why each tool was built. A sweeping work of intellectual seriousness that’s also studded with impish delights, Intuition Pumps offers intrepid thinkers—in all walks of life—delicious opportunities to explore their pet ideas with new powers. Speaking of ‘pet ideas with new powers’ prompts one to reflect on the amount of time that dogs spend thinking! As the following picture confirms! Pharaoh contemplating the meaning of life! We see instinct as common across all species including man, so why is so little known about it. Trusting your gut: Smart management or a fool’s errand? Photographer Mindy Véissid woke up one winter morning in 2010 with a simple idea: dogs running in the snow. “That’s all I had,” she recalled. The Manhattan resident followed her gut and went across town to Central Park. There, Véissid found three dogs jumping around in a couple of inches of new snow covering the famed park’s Great Lawn. 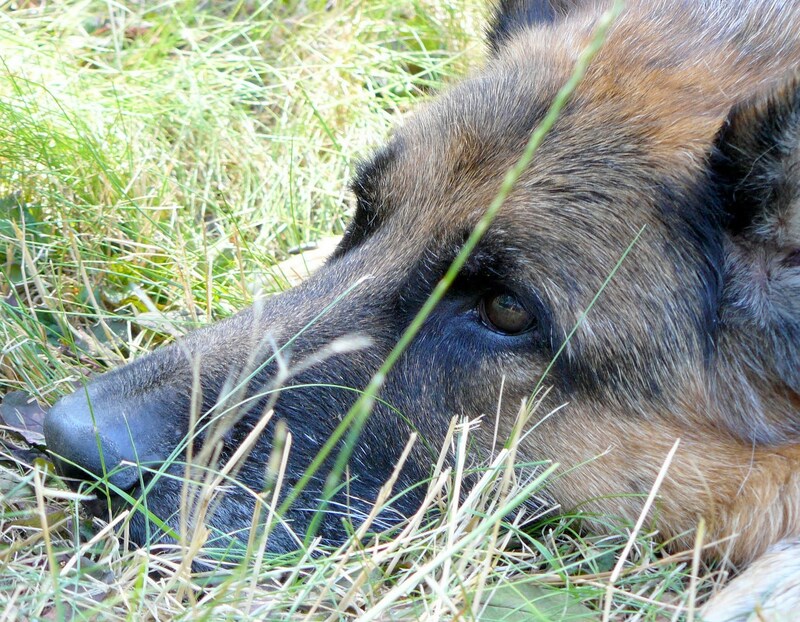 She plopped down in the field and waited. That’s when the dogs headed right for her. She snapped off a shot just before they barrelled over her. 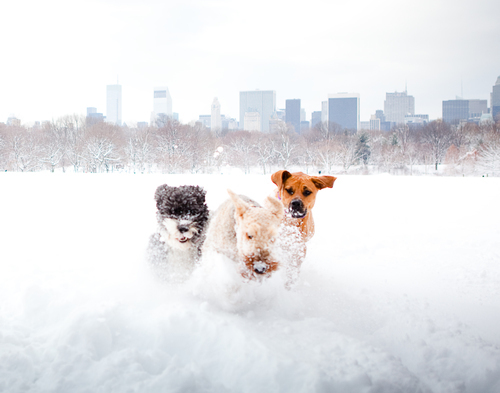 The picture she took that morning, of happy-looking pups charging through a cloud of snow with the New York City skyline behind them, has become one of Véissid’s calling cards, maybe her most recognisable shot. It’s a photo she would have missed if she had not trusted her gut. It wasn’t long ago that decision-by-intuition would have been regarded as little more than magical thinking or a try at luck. But research has changed that and intuition has been embraced as a key component to business decision making. There is, however, an inherent danger to it, and blindly following your gut can be worse than ignoring it altogether. For managers, that means learning how to trust your own instincts and encouraging employees to do the same. But it also means learning to recognise when careful planning trumps sudden inspiration. Perhaps the thing that most changed the way businesses think about inspiration was a 2008 study co-authored by Gerard Hodgkinson, professor at Leeds University Business School in the United Kingdom. Hodgkinson found that intuition can be beneficial in specific circumstances. First, it’s best to rely on a gut feeling when you need to make a quick decision. Second, and this is the important part, trust your intuition only when you have extensive knowledge on the subject. In other words, the best intuition is pulled from a well of deep knowledge and expertise. Wrong to republish the whole piece, however I do want to republish the closing paragraphs as they are so relevant to today’s post. Western cultures began to embrace intuition only recently, Pigliucci said, while research suggests Southeast Asian countries have long given credit to gut feelings being a good guide to decision making. Eastern managers, for instance, are more likely to rely on hunches and give them credit for successes afterward. After photographer Véissid learned to rely on her gut feelings, she wanted to teach others how to do it. Her class, the Art of Intuitive Photography, teaches the photography basics, but her instruction is more about following hunches. Follow BBC Capital on Twitter @BBC_Capital or follow us and join the conversation about this or any other Capital story on Facebook: BBC Capital on Facebook. * Eric is a freelance journalist who lives in Fort Lauderdale, Florida. He is formerly a writer and editor at New Times in Fort Lauderdale and The Pitch in Kansas City, Missouri. His work has been featured by the Florida Center for Investigative Reporting. To my mind, what Eric Barton has written about is not instinctive. That is if one believes that instinct is something that is ‘hard-wired’, so to speak, into our psyche at birth, a function of our genetic heritage. When one reflects on the start of life, ergo for all warm-blooded species that are the result of a successful copulation between the two genders of that species, then one realises that there is little functioning at birth beyond those bodily functions vital to that new life. But if we mean by instinctive those behaviours that are subconsciously acted out while the mind is engaged on other mental processes, then that’s different. Think of when we drive a car how much of what we are doing in the ‘hand-eye’ department is being managed by our subconscious brain. Think about the way we use a language, especially the language of our birth country. One will immediately recognise that the brain is on auto-pilot. Yet we were born unable to speak, or to drive a car! HOW FORCE BECOMES THE TRUTH OF MAN. Abstract: “Innate Knowledge” is a stupid idea. The truth is the exact opposite: KNOWLEDGE IS EVERYWHERE, OUT THERE.Knowledge is the opposite of innate. This insight has tremendous consequences on our entire prehension of the world. Subjective time slows down in smaller brains. Those wings go at 100 Hertz, four time the human perception limit. Thus time is relative; just as light-clock time slows down in a fast reference frame, or in a heavy gravitational field, neurological timeslows down in a small neurology. A lot of ideas on instinct came from studying insects: insects seem to know all, without having studied anything. However, if insect time flows slowly, insects actually have time to learn. And that’s rendered easier by having brains adapted to their environment. If they have only a few tricks to learn, and what looks like ten seconds for us is an hour for them, no wonder they learn lots. Thus slow in small explains how “instinct” works. Hence behaviors one describes as “instinctive” are just fast studies. A lot of the silliness about “genes” is thus dispelled, and the mind comes on top. Instinct As Fast Learning solves the nature-nurture problem. It also shows something else, even more important. It shows that the force of nature makes not just the force, but even the very geometry, of our minds. 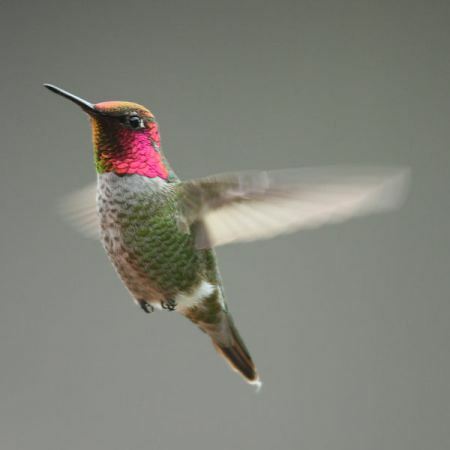 The minds of sentient species, from bees to hummingbirds, are exquisitely tuned to be programmed by the (part of) nature they are made to respond to, all the way to the speed of time they need. If we kill the environment, we kill out instruction set. The usual reason given to save the environment is that we would not want our descendants to live in a bad world. But what we see now is that a poor world gives poor minds, and that even time may go askew. Another, deeper than ever, reason to be a fanatical ecologist. Nature is not just our temple. Nature is where, and how, time itself is built, one neurological impulse at a time. On Monday, I have a sequel to this post. It’s an insight into the conscious and unconscious skills that come from flying a glider, or sailplane in American speak! Plus something that could just possibly be the key to mankind having a long-term sustainable future on this planet: The Power of Thinking. You will recall that the item from the BBC website opened with photographer Mindy Véissid waking up one winter morning in 2010 with a simple idea: dogs running in the snow. 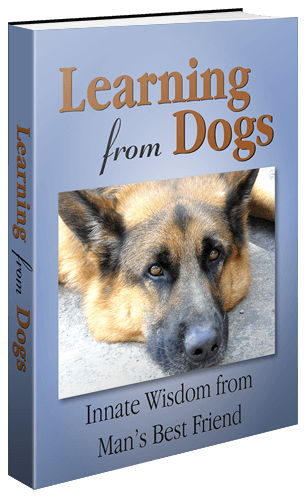 Too good not to miss for a blog called Learning from Dogs. So having given Mindy that small, but well-deserved, plug, I don’t feel too bad closing today with Mindy’s picture of those dogs running in the snow. Reflections on pain and peace. Seeking solace in these times of insanity. Not sure what it is about Tuesdays because exactly a week ago I wallowed in introspection with an essay Finding one’s true self and here we are again with another wallow! The pain came about when good friend, Chris Snuggs, included a picture link that is on Facebook in an email exchange we were having. Here’s that picture. Here are a couple of comments left on that Facebook page. Oh Dear God in Heaven. This is just so so so so so wrong. I am so ashamed of my species. Armina,you have said it right. Animals never sin,they never commit crime, they don’t go to war against each other. Humans do all these and they face the negative results of it. Who will save them? Who will protect them? The very humans that are to protect and save them, are the very heartless wicked people killing them … Sometimes I cry when I see animals being treated badly …. the world is a wicked place and they should not have been here among humans …. I wish there could be a place where there are no humans and no human can be able to go there no matter how hard they may try. So that all animals may go and live there ever safe. So all of this was reinforcing the pain I was feeling. I then turned to my email and there was a further reply in from Chris. Yes, it is a terrible photo, but no doubt there are far worse somewhere. One of the worst things about rhinos (and other large creatures) is that they clearly have largish brains and probably a lot more “consciousness” and/or “understanding” than we appreciate. And therefore are very much aware of what is going on, have pain and other “emotional” sufferings we can’t fully comprehend but which undoubtedly exist. I mean, they are not like fish I guess (though some maintain that even fish feel pain) or even more clearly insects. He had a point – sometimes one has to shut oneself off, but on the other hand and at other times if we all do that then the bastards can get on with their evil unchecked – or even uncommented. At least you in particular are spreading good vibrations and a moral view of the world. I feel the same about my political rants and blog entries. It may not do much to change the world but it could perhaps confirm to others that they are not alone in their protests about whatever. I would like to get engaged more actively in a particular “charity” or movement. One, since one cannot do everything. I might go for tigers and rhinos, etc. The last three years have been horrendous for me but I hope things will settle down a bit in coming months so I can do something more positive. I would just say to you that you SHOULD completely detach sometimes and WHEN you do you should relax TOTALLY and clear your mind of negative thoughts in order to return fully charged to the fray at a later stage!!! NO, you DON’T need a shrink for this but I understand that the US is well-equipped in this department if needs be!!! Now because of the time difference between here and Europe it was too late for me to check if Chris was comfortable about me sharing his personal email. But I took a gamble that it would be OK because of the power of Chris’ advice; the plain common-sense of that penultimate paragraph. Because if we end up consumed by the pain then, not to put too finer a point on it, the bastards have won! 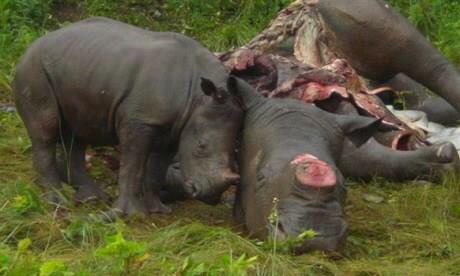 If we can feel the pain but stay grounded, remaining at peace, then that poor rhino did not die in vain. So please go now and sign the petition Save the Rhinos! Truth never follows a straight line. 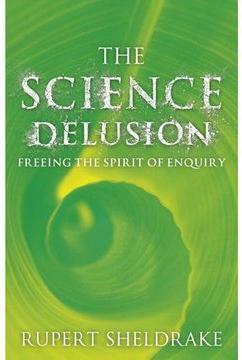 “A delusion is something that people believe in despite a total lack of evidence.” Richard Dawkins. Yesterday, I started down the road of determining how one gets to the truth of a complex issue. I called the post Doggedly seeking the truth. My proposition was effectively saying that just because a person believes in argument ‘a’ or argument ‘b’ that doesn’t of itself make ‘a’ or ‘b’ the truth. The deliberate spreading of misinformation is a fundamental part of the industry-led movement to deny the reality of anthropogenic climate disruption. Alex Rawls is just part of this campaign and I therefore do wish that you would consult me before deciding to help publicise and/or lend credence to such nonsense. Now I have every sympathy for Martin’s outpourings of feelings; his blog is based on the conviction of his own beliefs. A position of integrity. But taken literally, Martin’s words, “consult me before deciding to help publicise” mean that he wishes to influence what I choose to write. Of course he didn’t mean to convey that. Back to yesterday’s post. With Dan’s permission, I reproduced the personal email that he sent me with those two articles. Dan isn’t on the payroll of the Koch brothers or blindly following an “industry-led movement to deny the reality of anthropogenic climate disruption“, he is a thinking human who is yet to be convinced that AGW is as rational a process as, say, gravity! So if Dan is not convinced about the effects that mankind is having on Planet Earth, then spare a moment to ponder about the millions of others around the world who are far less capable, even if they had the time and inclination, to adopt a rational, open-minded view of the complexity of AGW. There are so many insoluble dilemmas concerning industrial civilization, it’s almost impossible for anyone to attempt to propose a “solution”, or attempt to describe the work that now needs to be done, without becoming a hypocrite. At this stage, hypocrisy is unavoidable. Beyond the point of overshoot, at least in our culture, all that’s required to be a hypocrite, is to be alive. “If we act as if it’s too late, then we becomes a self-fulfilling prophesy”. Basically, implying that we shouldn’t accept that it’s too late. Yes? The evidence that now exists, has established an immovable catastrophe, which is now, well outside human agency ( aside from the looming boondoggle of geo-engineering). This is what the evidence shows. We have effectively already become a self-fulfilling prophesy. The most dire warnings of the last three decades, have now become prophetic. What are eight non-reversible feedbacks if not a physical manifestation of a self-fulfilling prophesy? Daniel, you’re asking the same questions many others have been asking lately. I’ll try to respond with my next essay, which I’ll complete and post in a couple days. Seems to reinforce the message. That we really shouldn’t be surprised at the delusions, games and power interplays going on, especially in the corridors of power, so to speak. Right! Time for me to show my hand! I am totally convinced that we humans are responsible for the rising levels of CO2 in the atmosphere and that this accounts for the majority of the abnormal weather events being experienced in so many parts of the planet. I think I’m right. Therefore I give more weight to the evidence that supports my view that, guess what, reinforces me thinking I’m right. Is that scientific? Of course not! Science is about producing reproducible outcomes. With, say gravity, that’s a piece of cake. I’m not a scientist, far from it. Therefore the following statement may be unreliable. That the problem with producing an uncontroversial, hard-wired proof that man is screwing up (you see, I did say that I wasn’t a scientist) our planet is that we don’t have other planets with which to test the thesis. When it surely is an uncontroversial, hard-wired proof it will be too late! Having said all that, tomorrow I will present the best evidence that I can find to support the notion that Dan’s beliefs are wrong. Now where’s that scent now? Sweeny, help me! Hang on, let me finish sniffing your bum! Ask Ruby to help, she’s just by the fence. We can never be as rational as dogs. But maybe if we learnt to live more in the present, as dogs do so well, the world would be a much simpler and sustainable place. On the road, there’s little possibility to develop a lasting relationship. I throw a Molotov cocktail into the conversation, and then I leave the area. Essence of wisdom, page one. Thus spoke Confucius, albeit not in the English language! But, nonetheless, those words from so, so long ago (he lived to the age of 73 – from 551 until 479 BCE) resonate very strongly 2,500 years later. That was the easy bit! I’m not entirely clear as to why a variety of items that have crossed my ‘in-box’ in recent days seem to offer some sort of cohesive sense. But they do to me and I’m going to draw them together. I will leave you to be the judge as to how well it worked! Thus over the next three days I am going to reflect on three topics. The challenge of how we humans make sense of the world, how we confuse what we do with what is best for us, surely the essence of wisdom, and the growing gap between the wisdom of millions of citizens and their leaders. I should quickly add that much of my musings are due to this scribe standing on the shoulders of giants than seeing clearly from his own level. Today, I shall start with the brain. Your brain, my brain, the brains of humans. The reason this trilogy starts with the brain is that, ultimately, everything we humans think, feel and do comes from this brain of ours. Our brain is who we are. Let me offer you this video made by Bristol University in England. Just a little over 6 minutes long it sets out the functional story of our brain. But there is so much more to this ancient body organ. The simplest description of a black hole is a region of space-time from which no light is reflected and nothing escapes. The simplest description of consciousness is a mind that absorbs many things and attends to a few of them. Neither of these concepts can be captured quantitatively. Together they suggest the appealing possibility that endlessness surrounds us and infinity is within. But our inability to grasp the immaterial means we’re stuck making inferences, free-associating, if we want any insight into the unknown. Which is why we talk obscurely and metaphorically about “pinning down” perception and “hunting for dark matter” (possibly a sort of primordial black hole). The existence of black holes was first hypothesized a decade after Einstein laid the theoretical groundwork for them in the theory of relativity, and the phrase “black hole” was not coined until 1968. Likewise, consciousness is still such an elusive concept that, in spite of the recent invention of functional imaging – which has allowed scientists to visualize the different areas of the brain – we may not understand it any better now than we ever have before. “We approach [consciousness] now perhaps differently than we have in the past with our new tools,” says neuroscientist Joy Hirsch. For example, we don’t understand how the brain creates colors. That’s a perception that is very private – I don’t know that your perception of blue is like my perception of blue, for example. Smells are another one. I don’t know that your perception of the smell of an orange is like mine. These are the hard problems of neuroscience and philosophy that we haven’t made a great deal of progress on. What do you think? Is the distinction between “hard problems” and “soft problems” useful, or reductive? Does the brain create consciousness? Will we ever empirically understand where it comes from or how it works? Human consciousness happens in the human brain. The human brain’s functions are rooted in what the human senses relay to it. Self consciousness, consciousness of what is around us, is the result of thinking. There would be no thoughts if the brain were a tabula rasa (Latin for blank slate), had no input from the senses. Therefore, consciousness is quite local, quite mortal, quite dependent on the gray matter inside our skulls. Local and mortal. Very profound (I think!). So, if you like me suffer from time to time from understanding oneself, don’t worry. There are plenty of others – aren’t there? As Professor Dan Dennett makes it all clear below. Philosopher Dan Dennett makes a compelling argument that not only don’t we understand our own consciousness, but that half the time our brains are actively fooling us. Philosopher and scientist Dan Dennett argues that human consciousness and free will are the result of physical processes and are not what we traditionally think they are. His 2003 book Freedom Evolves explores the way our brains have evolved to give us — and only us — the kind of freedom that matters. Stay with me for ‘page two’ of Essence of wisdom coming out tomorrow. A most beautiful message from Paul Chefurka This republication of a recent item on The Permaculture Research Institute website comes with the written permission of their editor, for which I am very grateful. Nothing from me will add to this very personal essay, so with no more ado here it is. Whenever I contemplate the spectacular mischief that we humans have wreaked on our world, I am compelled to ask how this could have possibly happened. The despoilment of our planet seems to be the exact opposite of how I would expect a thinking, feeling, caring creature to treat their home. What could have driven us to this, and what perverse qualities could have allowed us to ignore the consequences of our actions for so very long? At first blush, our problems seem decidedly physical. Dangerous gases drift in the air; acidity rises slowly in the ocean as the fish disappear from its depths; garbage and detritus of all kinds fouls the land where lush forests and grasslands once ruled. All these disturbances point back to human actions. The proximate causes of this planet-wide distress include economics, politics, and personal and corporate greed – all facilitated by a technological cleverness that rests on a bed of dispassionate science. I have spent over 50 years of my life trying in vain to understand our environmental problems as purely physical problems. When I viewed them in those terms, the fact that such problems even existed in a rational, scientific culture seemed nonsensical. However, when I recently began to understand them as consequences of a rupture in the human spirit they finally began to make sense to me. Yes, they are compounded by political and economic forces, but in my view even politics and economics are simply consequences of the same qualities of the human psyche. Since the dawn of consciousness, human societies have been driven by a complex web of factors with their roots embedded deep in our evolved human nature. Power relationships and hierarchies, kinship and xenophobia, selfishness and altruism, competition and cooperation, curiosity and apathy, and countless other polarities mingle together to form the infinite variety of human dynamics. Underneath it all, though, lurks our self-awareness. Human self-awareness is the root of our sense of separation from the natural world, and from each other for that matter. It’s the crowning paradox of the human condition – at once both our greatest glory and our fatal flaw. It is behind the dualism – the perceptual split into subject and object – that gave us science. It’s the source of our ability to see others as “different yet the same”, giving us the power to act altruistically. It’s also behind the sense of self and other that has allowed us to assume dominion over all we survey, whether animal, vegetable, mineral or human. Our sense of separation is the rupture of the human spirit that has allowed our current predicament to develop. If this is the case, then no physical, political or economic remediation will heal the wound. The solution to our predicament is not – cannot be – material, political, economic, or simply philosophical. If a “solution” exists at all, it’s orthogonal to all those domains. Only by healing our belief in our separateness will we be able to finally and fully restore our balance with Nature. When I began to view the situation like this, I was finally able to see that there are in fact solutions, where none had previously been visible. These new solutions don’t attack the predicament directly as a series of material, political, economic or technological problems. Instead, they seek to effect change from the center, by encouraging people to mature into an inter-connected adulthood and assume personal responsibility for their actions. The mischievous idea of science and technology as a post-modern “religion of salvation” with Ray Kurzweil’s transhuman singularity playing the role of the Rapture and an economist making a cameo appearance as the Devil (think infinite growth on a finite planet…) resonates very strongly with me. But to be a little more precise, it’s not exactly science that has failed us. We have been undone by a toxic stew of classical economics, technological cleverness, love of progress, an attitude of Manifest Destiny and an unwillingness to accept any limits on our growth. Technology lets us use scientific discoveries to satisfy human desires of all kinds. When we harness scientific knowledge to human ends, the outcomes we choose to implement are based on our wishes. If our wish is dominion over nature, we will use scientific principles to invent technology like mining machinery, continental energy grids, factory farming and the automobile. Of course, each of those inventions is presented within our cultural narrative as an obvious, irrefutable boon. One of the points of having a cultural narrative is to put a positive spin on human activity. The spin is always in line with the narrative – or more precisely, in line with the wishes of those who create and sustain the narrative. The fact that these inventions, the technological expressions of science, have a subtext of dominion over nature is carefully camouflaged, and the idea that this might possibly be a bad idea is thoroughly discouraged. None of this would have been so damaging if people didn’t have such a natural ability to delude themselves into believing that whatever they wish for hard enough is possible. It’s kind of like clapping for Tinkerbell. “The future is always going to be better than the past,” and “My kids will have better jobs, bigger houses and faster cars than I did,” are examples of such magical thinking at its finest. Those two kinds of wishing – the wish to improve the human condition and the wish to see the human milieu keep growing forever – are not inherently different. I see them more as two points on a continuum. On one end is simple desire; on the other end is unreasonable desire. They are distinguished less by any intrinsic difference than by the attitude and realism of the one doing the wishing. It can be very difficult to tell when the reasonable morphs into the unreasonable.”I wish to own a small piece of land” becomes “I wish to own an entire island” which inflates into “I wish to claim a continent for my King” and eventually becomes “I wish to rule the world.” The underlying desire is the same; it’s just the scale and reasonableness of the wish that changes. Whether or not a wish is realistic or deluded depends very much on the one doing the wishing. There are people who wish for our (and by extension, their own) material wealth to continue growing forever. There is no shortage of economists who will tell them that such a strange thing is possible. Are the dreamers deluded? Are the economists deluded? What laws of nature would need to be violated for such a delusion to become reality? How is the worship of the Charging Bull of Wall Street materially different from worshiping the Golden Calf of the Bible, when both imply a violation of the laws of nature? The world changes only when enough people have made a choice to change themselves. At what point will we each say, “Enough!” and choose a different path? Is anything keeping you from making that choice right now? As you finish reading this article I invite you to say it quietly to yourself. You can read more of Paul Chefurka’s writings on the PRI website here. Do, also, visit Paul’s website here. You will not be disappointed. Finally, let me do two things before closing. The second is to highlight on Paul’s website his Public Domain Notice statement: Any article on this web site may be reproduced by anyone, in whole or in part , in any manner and for any purpose whatsoever, with no restrictions. Spread the word about you, me and all of us being the change the world needs – and needs now. Thank you. The truth is always our friend. The last couple of weeks of Posts seem to have been rather dominated by the risks to the planet’s biosphere from the highly probable actions of mankind. I feel a little uncomfortable about this as Learning from Dogs is not a single issue Blog. Well not in the sense of a tightly defined issue. But in another sense, it is about the issue of integrity; about raising the values of truth and openness so that it’s clear how we are to move forward as a species and pass through these ‘interesting times’ with hope and confidence. If we don’t embrace the truth of what is happening to our planet, then we can’t embrace change. With thanks to the Yale Forum on Climate Change for promoting this video. 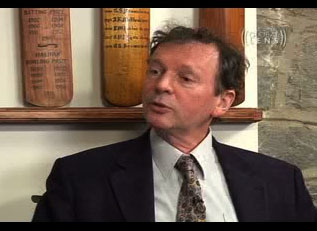 Previously, I had written about what Rupert Sheldrake calls morphic resonance and morphic fields, see my article here. In my last newsletter I said that the UK launch of my new book The Science Delusion would be streamed live from Kings College, London University, on January 17, but unfortunately the internet connection at King College broke down, so this did not happen. The unlucky fact that our current form of mechanistic materialism rests on muddled, outdated notions of matter isn’t often mentioned today. It’s a mess that can be ignored for everyday scientific purposes, but for our wider thinking it is getting very destructive. We can’t approach important mind-body topics such as consciousness or the origins of life while we still treat matter in 17th-century style as if it were dead, inert stuff, incapable of producing life. And we certainly can’t go on pretending to believe that our own experience – the source of all our thought – is just an illusion, which it would have to be if that dead, alien stuff were indeed the only reality. Werner Heisenberg, one of the founding fathers of quantum physics, once observed that history could be divided into periods according to what people of the time made of matter. In his book Physics and Philosophy, published in the early 60s, he argued that at the beginning of the 20th century we entered a new period. It was then that quantum physics threw off the materialism that dominated the natural sciences of the 19th century. Mark Vernon closes the fascinating piece with these tantalising words. The analogy has the benefit of naturalising extrasensory perception, Watts notes. But it also raises problems. For example, how would it be possible mentally “to touch” objects that don’t exist, as would happen when contemplating a centaur? Watts concludes: “An adequate account of the mind must encompass both first- and third-person description whereas the idea of a ‘field’, along with the other spatial descriptions that Sheldrake uses, seem to be exclusively third-person type descriptions.” Oddly, this is a strikingly 19th century attitude to have. Nonetheless, Sheldrake must welcome such serious engagement with his work. He may not be right in the details. But he is surely right, with Heisenberg, in insisting that the materialist world view must go. Don’t rely on my short excerpts, read the article in full here. For my money, this will be a book that I won’t miss reading! Why should such an obvious concept, that of truth, be so very difficult to define? Democracy is utterly dependent upon an electorate that is accurately informed. In promoting climate change denial (and often denying their responsibility for doing so) industry has done more than endanger the environment. It has undermined democracy. There is a vast difference between putting forth a point of view, honestly held, and intentionally sowing the seeds of confusion. Free speech does not include the right to deceive. Deception is not a point of view. And the right to disagree does not include a right to intentionally subvert the public awareness. Despite my chest-beating on the subject of politicians and leaders deliberately lying in that recent piece about Juncker, there’s something much more fundamental. What defines lying is really not that important. It’s whether or not we trust that our leaders are doing their best for their constituents, to the best of their abilities. Whether you support left-leaning or right-leaning policies is unimportant; indeed political differences and the ability to vote for one’s beliefs is at the heart of an open democracy. But if we don’t trust that our leaders are doing their best for our country then that causes the destruction of faith. If we do not have faith in those that lead us then the breakdown of a civilised social order becomes a very real risk. Truth is one of the central subjects in philosophy. It is also one of the largest. Truth has been a topic of discussion in its own right for thousands of years. Moreover, a huge variety of issues in philosophy relate to truth, either by relying on theses about truth, or implying theses about truth. It would be impossible to survey all there is to say about truth in any coherent way. Instead, this essay will concentrate on the main themes in the study of truth in the contemporary philosophical literature. It will attempt to survey the key problems and theories of current interest, and show how they relate to one-another. A number of other entries investigate many of these topics in greater depth. Generally, discussion of the principal arguments is left to them. The goal of this essay is only to provide an overview of the current theories. The problem of truth is in a way easy to state: what truths are, and what (if anything) makes them true. But this simple statement masks a great deal of controversy. Whether there is a metaphysical problem of truth at all, and if there is, what kind of theory might address it, are all standing issues in the theory of truth. We will see a number of distinct ways of answering these questions. “Truth has been a topic of discussion in its own right for thousands of years.” So I’m not the first and certainly won’t be the last to ponder on how one gets to know the truth. Do I have any answers? None! Except, perhaps, to muse that if truth can be so difficult to pin down then adopting a rigid stance based on assumptions of truth will carry risk. And, of course, to reflect that dogs don’t lie. I’ll close with the quote from Oscar Wilde, “Truth is rarely pure and never simple.” Quite so.